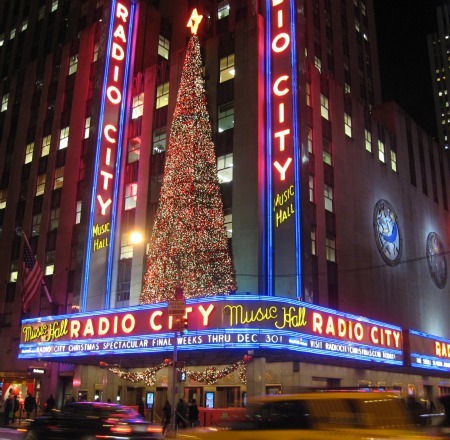 Now, normally I’m a Broadway Baby, however, as it’s Thanksgiving here in the US today, which, for Americans, marks the start of the holiday season, I decided to venture out to Radio City Music Hall to see their Christmas show, featuring the Rockettes. The venue itself is magnificent and really blew me away – after several nights enduring drab Broadway theatres, I have to say that Radio City Music Hall had me at the front door! I love 1930s design and it’s a scandal that they only let you in ten mins before the start of the show, which means you don’t have time to explore properly. In fact, I’ve booked on the venue tour to get a proper look around. The Great Stage itself is sensational,worthy of the title and very versatile. The projection which is part of the production makes full use of the architecture of the building, and, in this production, they’ve really embraced technology with drone snowflakes and the like. The show even has THREE(!) camels in it and a donkey, all for the nativity scene! I’ll tell you now, my eyes popped out of my head, and I was open mouthed in disbelief. In terms of the venue, the theatre seats approx. 6,000 people. On Saturday coming, for example, they do six shows – that’s potentially 36,000 seats in one day. I know of some West End productions that struggle to fill 1,000 a performance. If you’re in New York this festive season then I implore you to visit the Christmas Spectacular – it’s genuinely the best thing I’ve done whilst here! TKTS seem to carry tickets daily (sometimes with 50% discount on certain performances), and I’d recommend the 1st Mezzanine (Dress Circle for we Brits) for the best view.